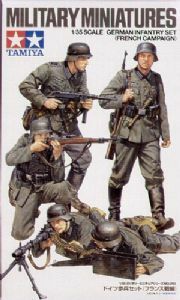 【 Storming the Western Front 】　High-quality figure set depicts a squad of German infantrymen in action during the Battle for France in 1940. 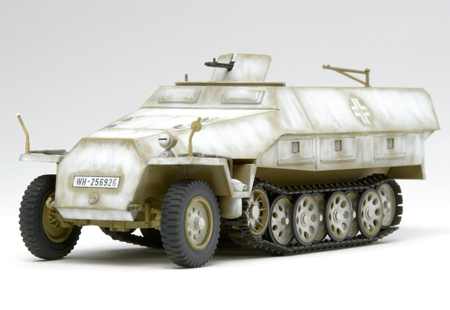 ★Set includes 1 MP40-carrying officer, 2 riflemen, and a machine gunner and loader in prone position. 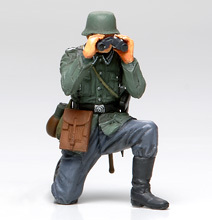 ★Officer and rifleman can be assembled in various poses. Using multiple sets enables depiction of over 8 different poses. 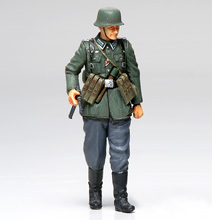 ★Helmets with camouflage belt included. ★Weapons and equipment all feature sharp surface details. 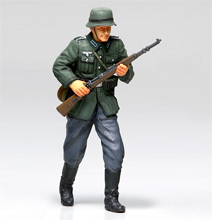 【 About the Uniform 】　The M36 field uniform, featuring a jacket with a green collar and the distinctively-shaped M35 helmet, was used by the German army at the start of WWII. However, the Y-type suspenders had not yet been issued to all units at the time of the French Campaign.